Are you good with numbers and money management? Are you interested in investment, the stock market or fund management? The finance and insurance industry is a great option for career-seekers looking for a challenging and fast-paced career. Finance is Charlotte’s most well-known industry due to the presence of major global banks and insurance companies including Wells Fargo, Allstate and Brighthouse Financial. Bank of America is headquartered right here in the Queen City. 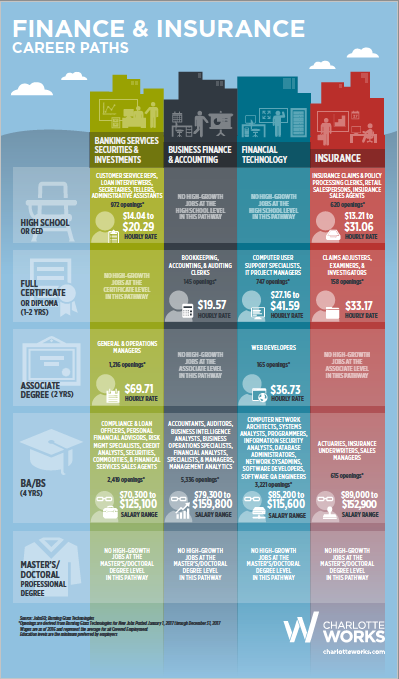 Our Career Ladder outlines each Career Path available in the Finance and Insurance industry for every level of education. Download the career ladder to discover where your career in Finance and Insurance can start today!